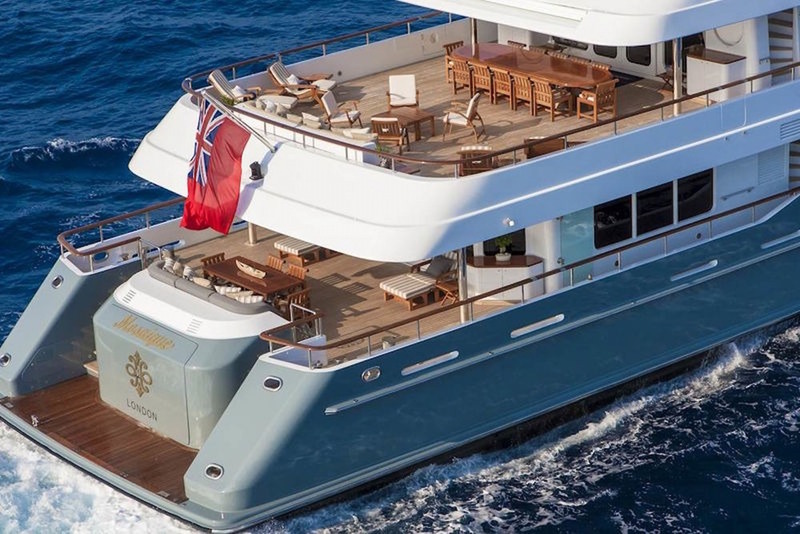 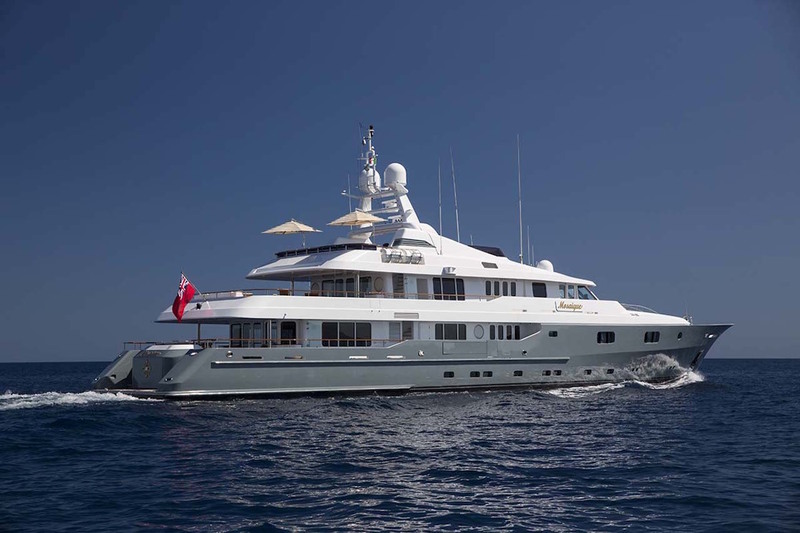 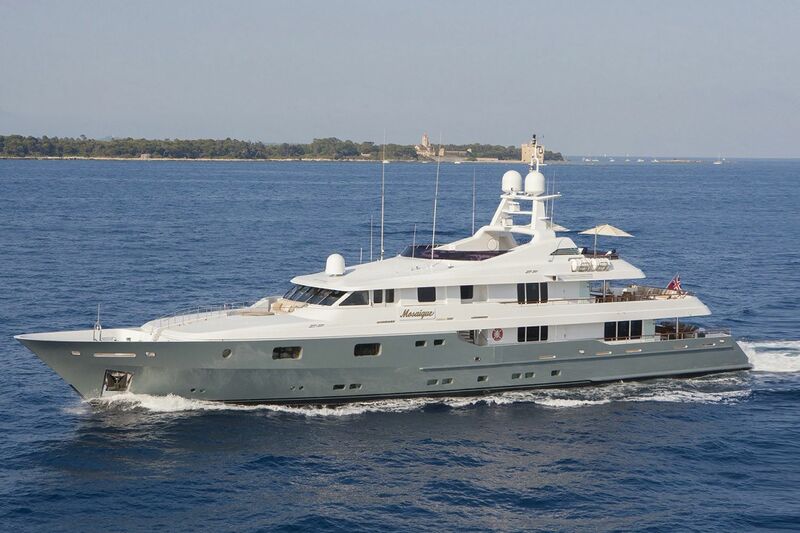 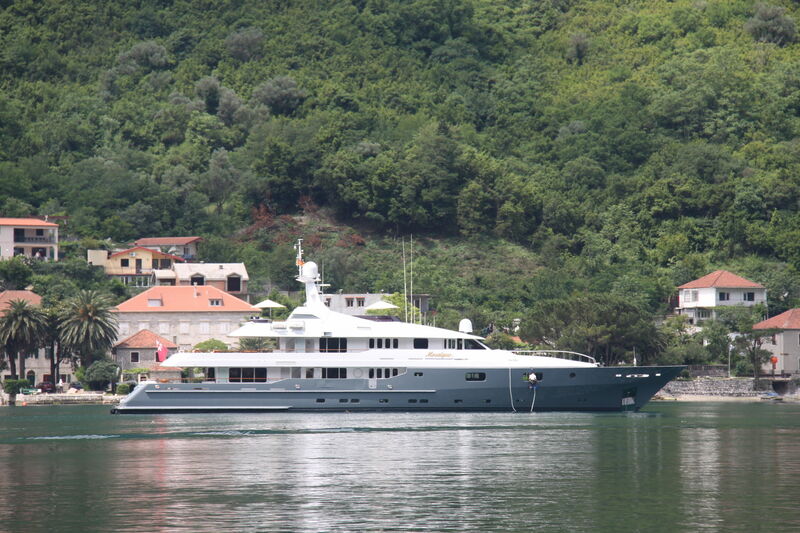 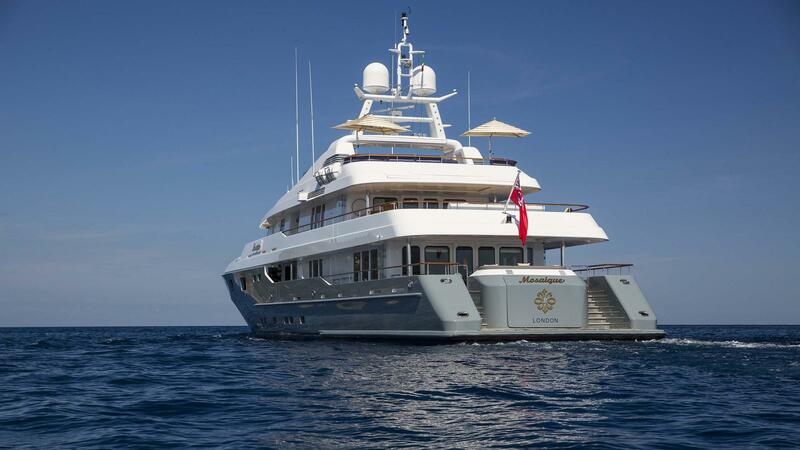 Luxury Yacht Mosaique, which charters in the Mediterranean & Caribbean, is a superbly stylish and refined motor yacht. 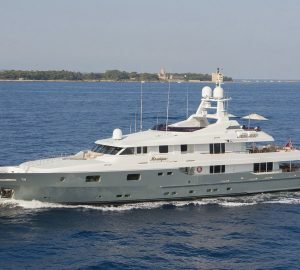 MOSAIQUE is 50 meters in length (164'), and she was launched in 2001 by Proteksan Turquoise and designed by Dubois Yachts of England with interior by Donald Starkey. 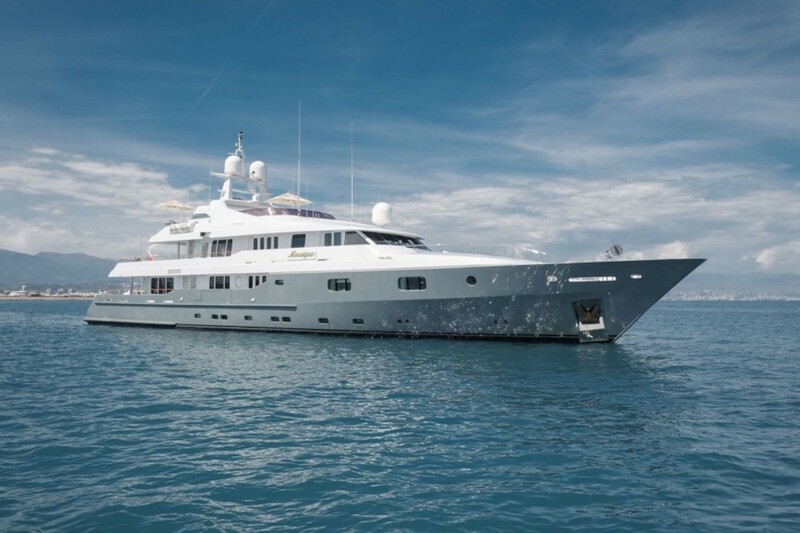 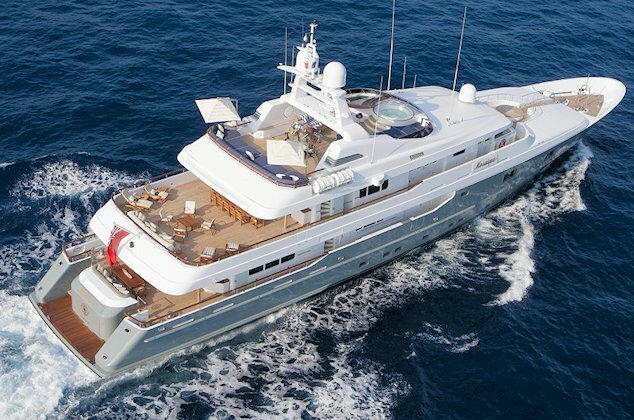 She has become well known as a successful yacht within the charter industry, and amongst charter guests, for providing a superior charter experience through her superior design and first rate professional crew. 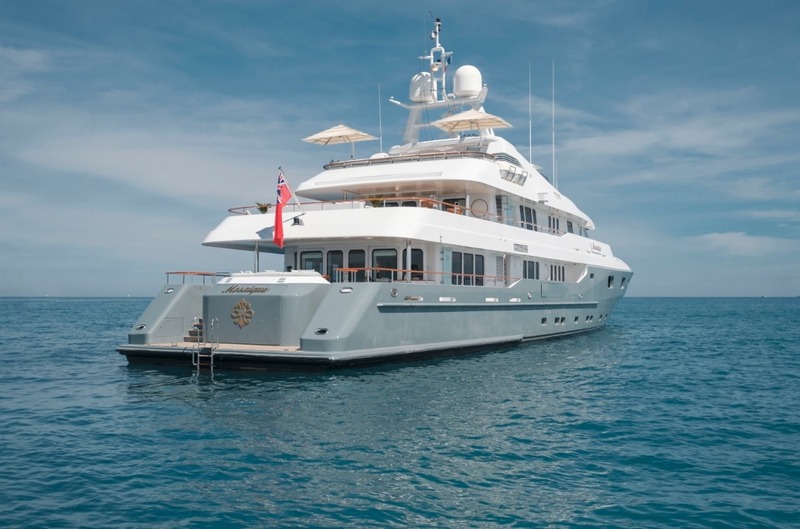 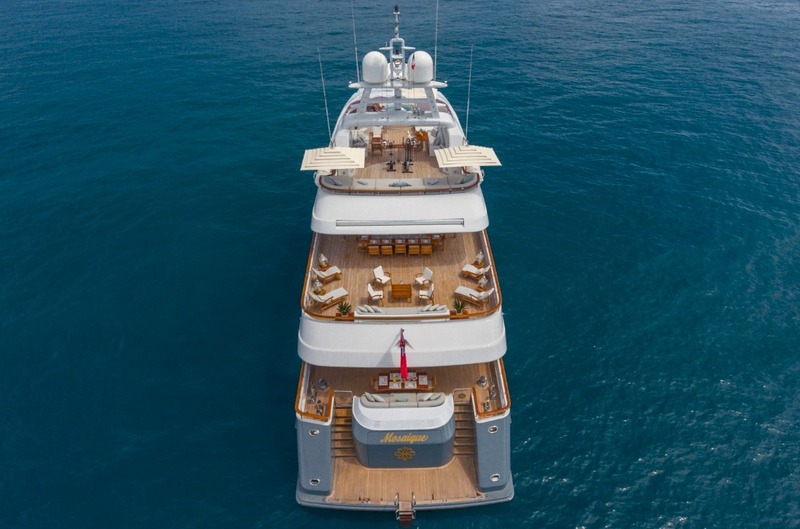 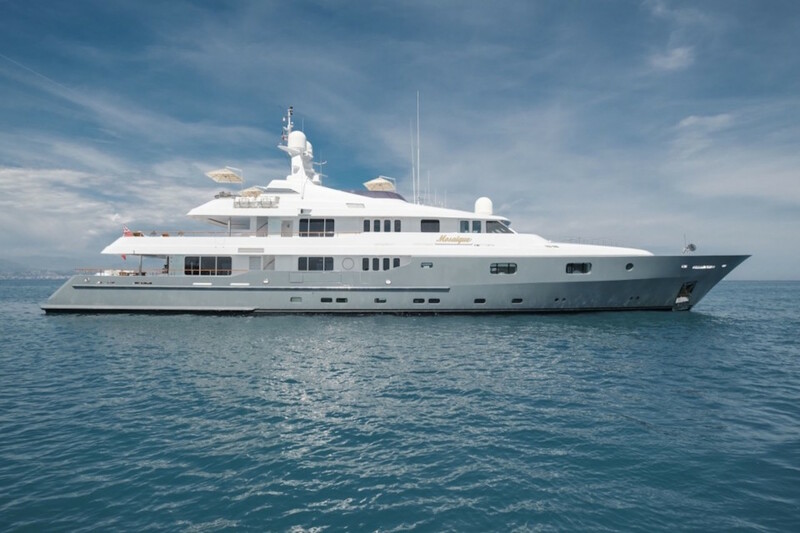 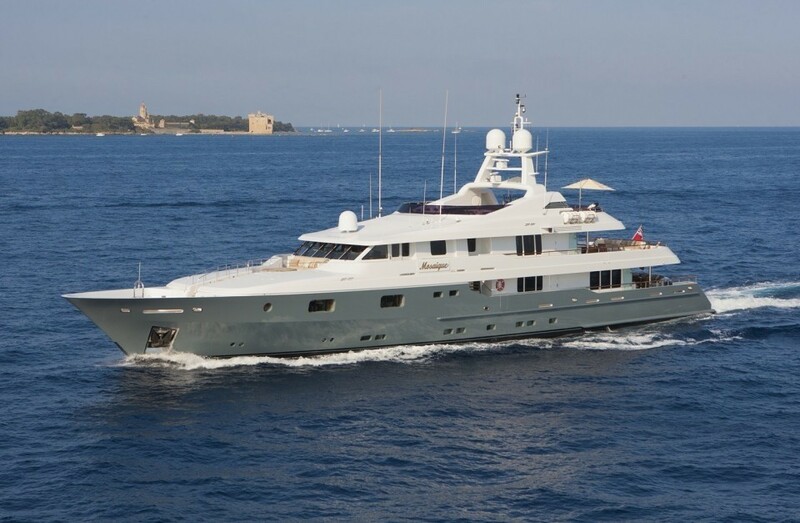 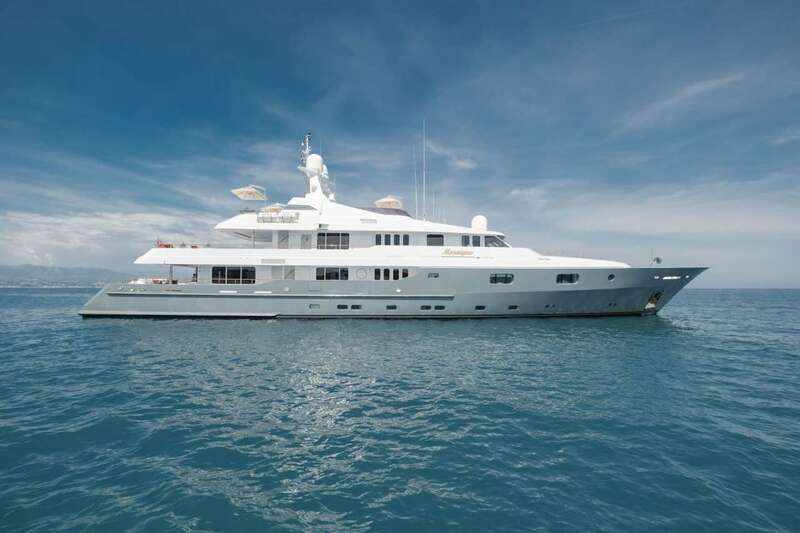 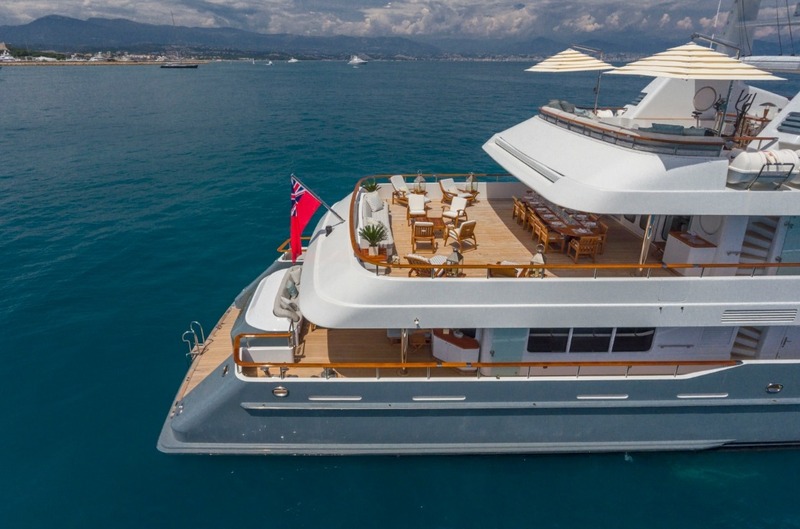 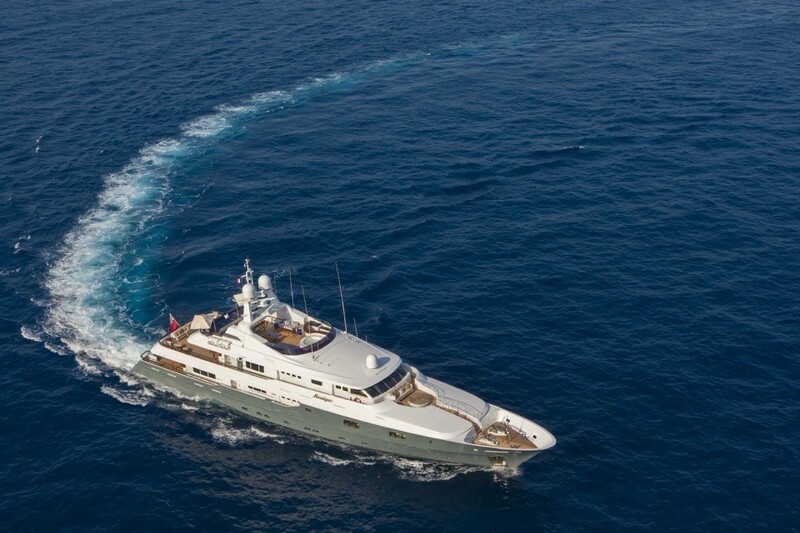 Since M/Y Mosaique has been chartering her excellent reputation is well deserved. 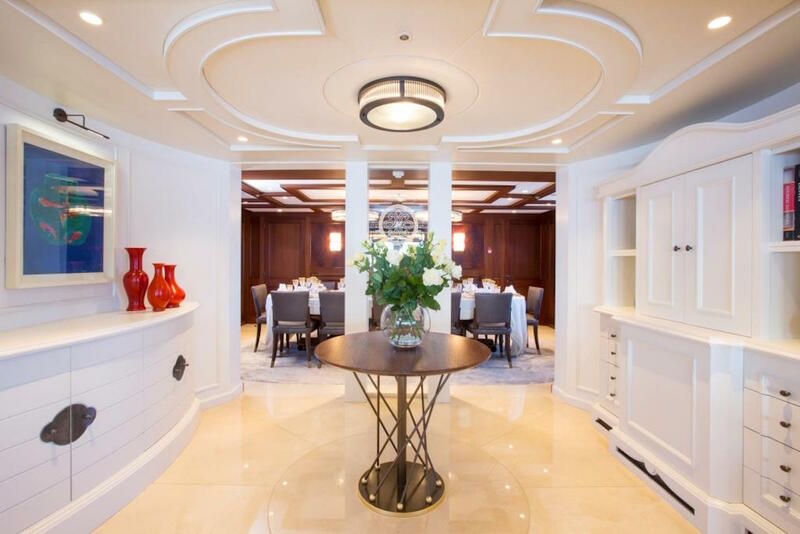 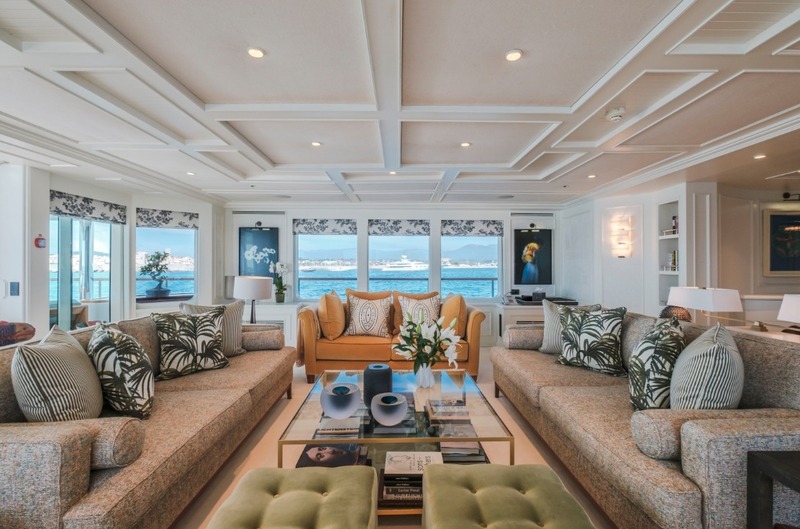 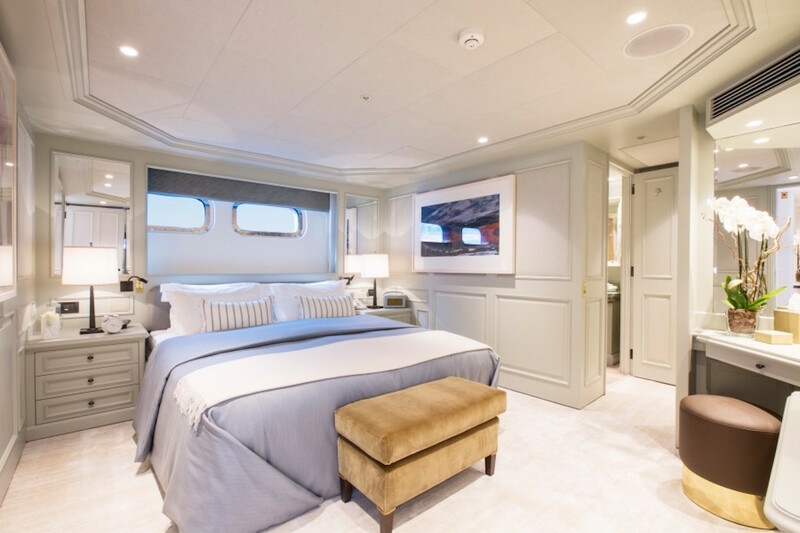 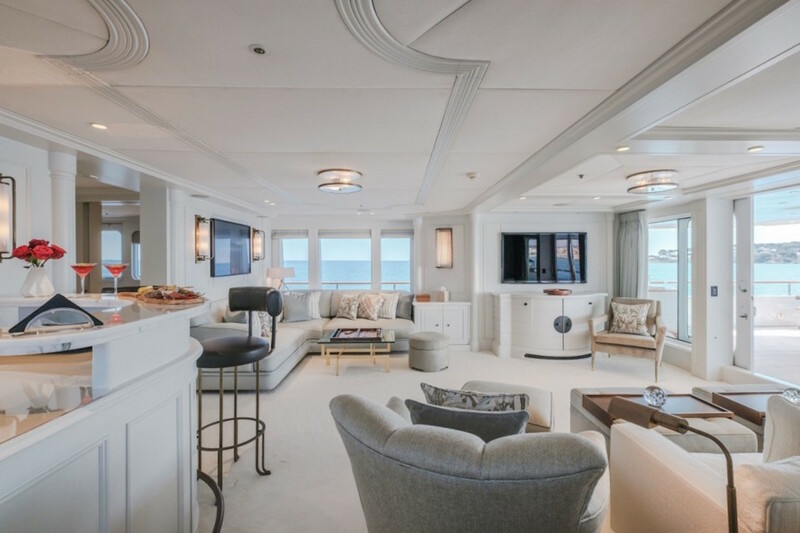 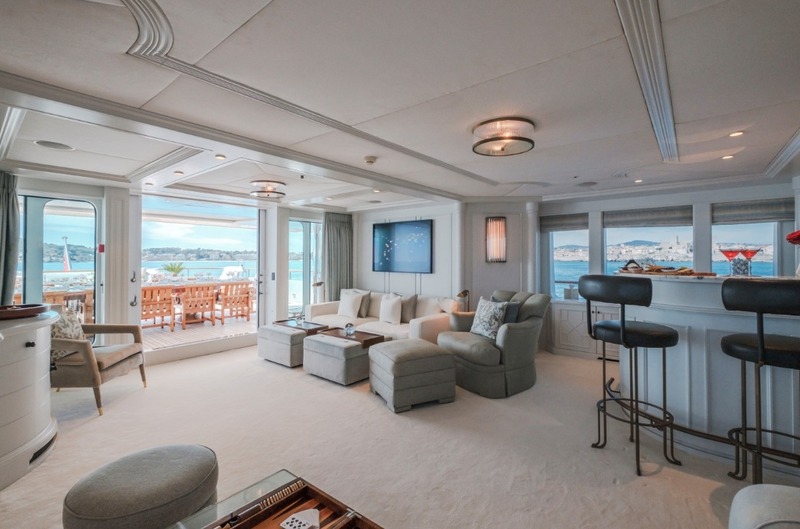 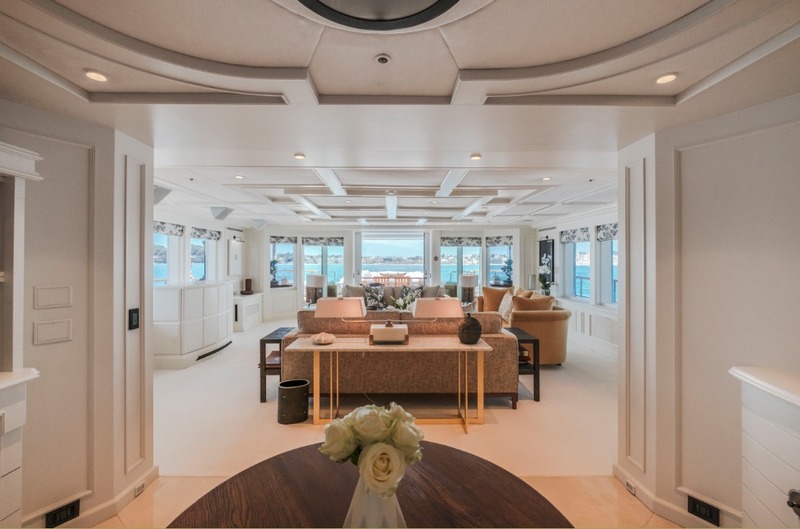 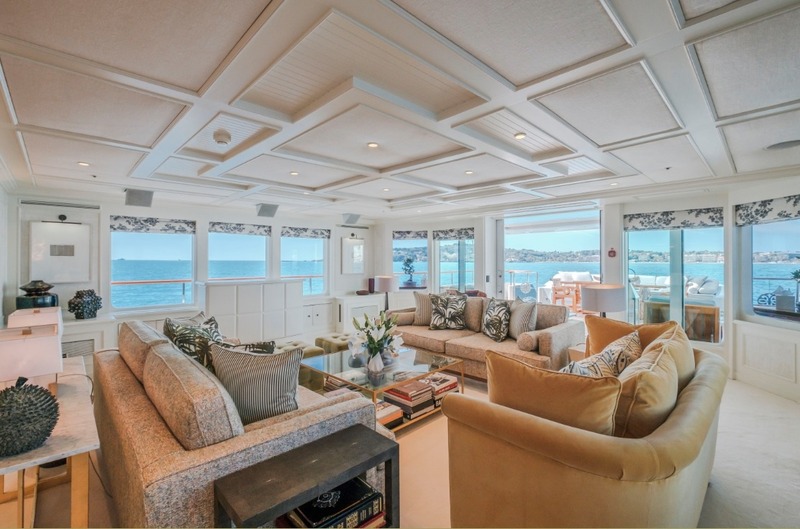 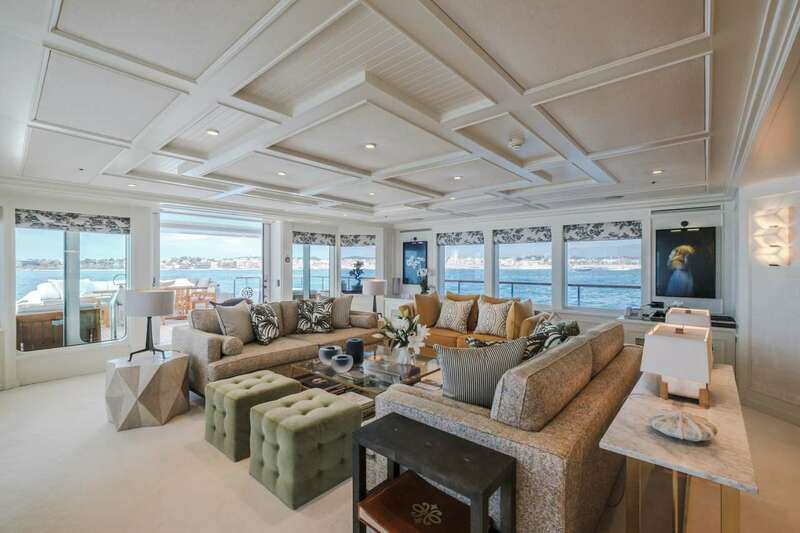 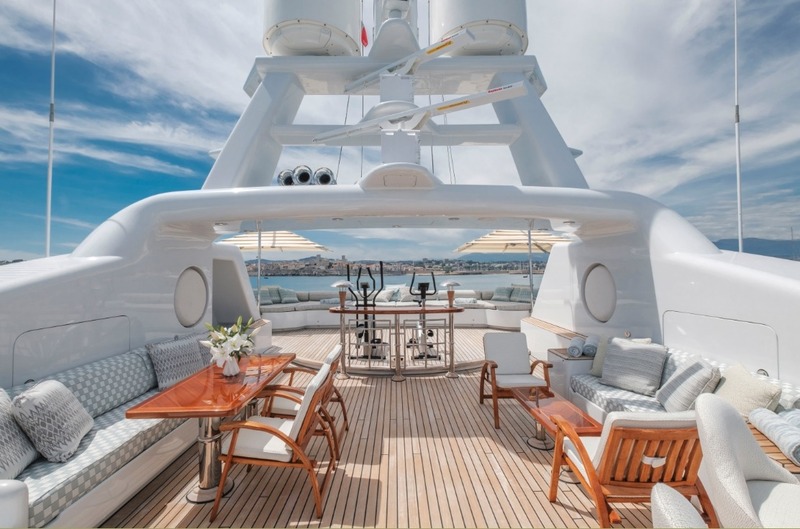 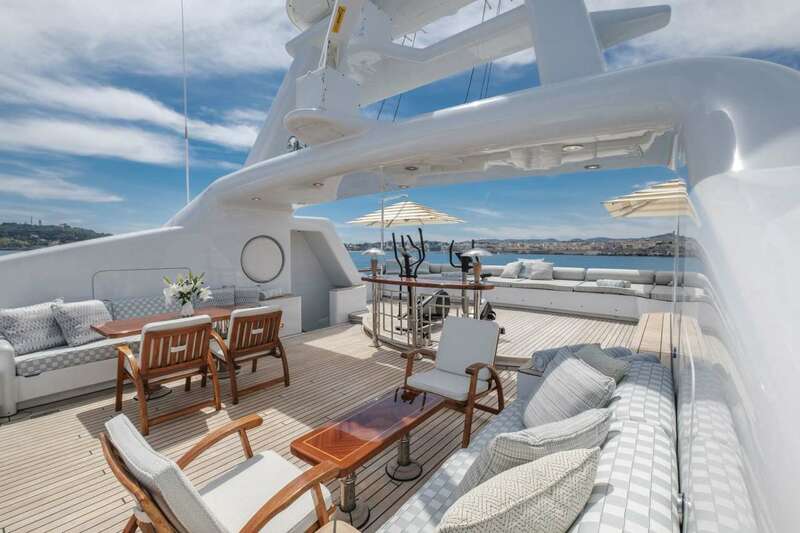 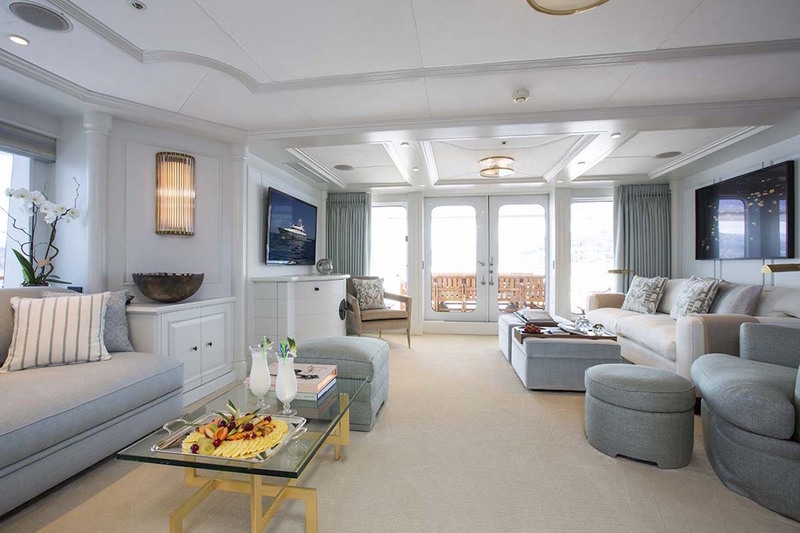 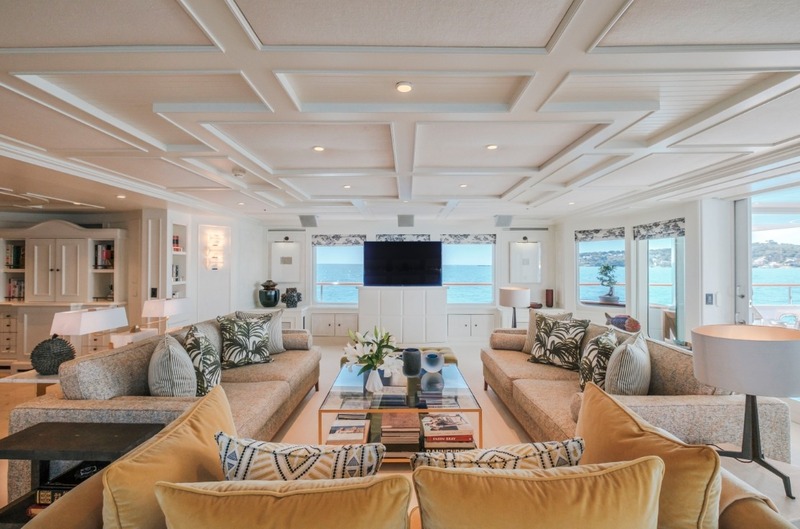 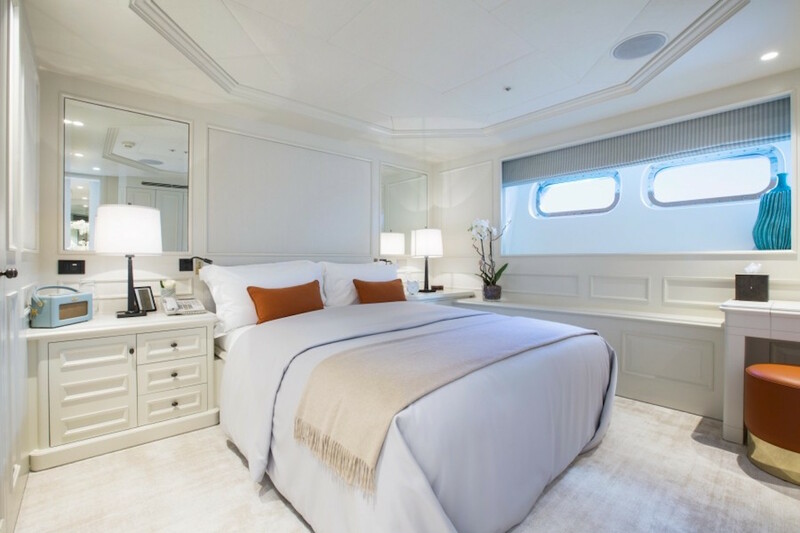 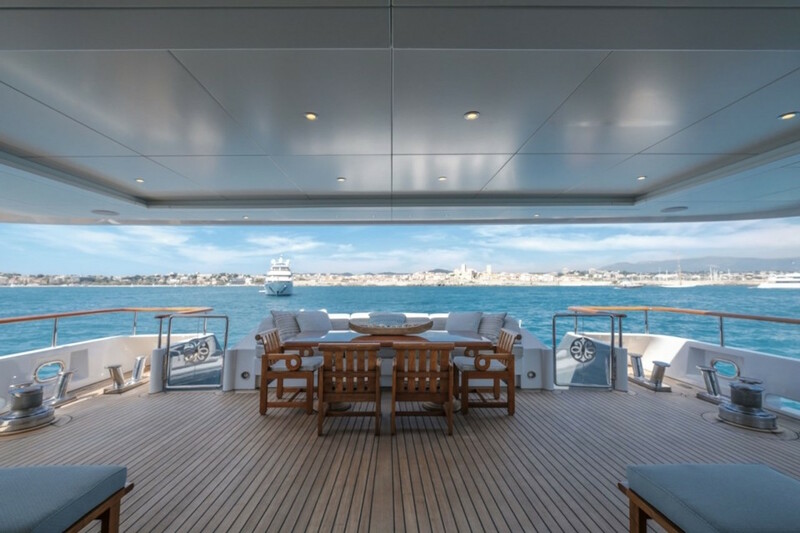 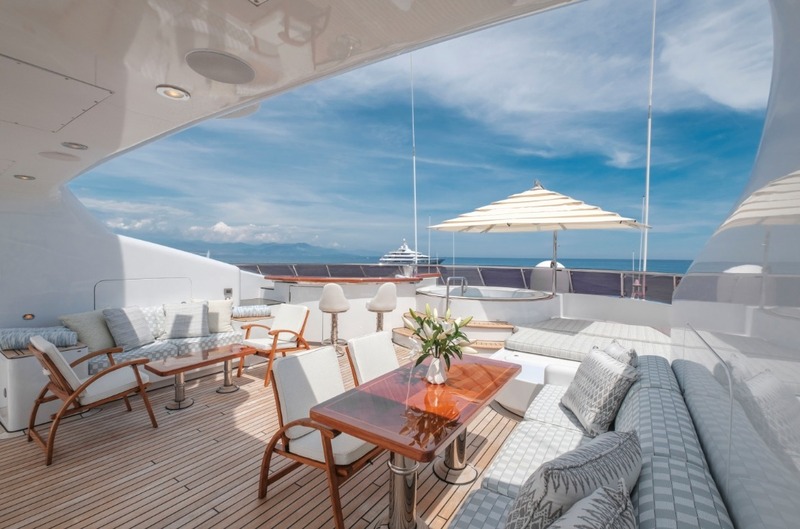 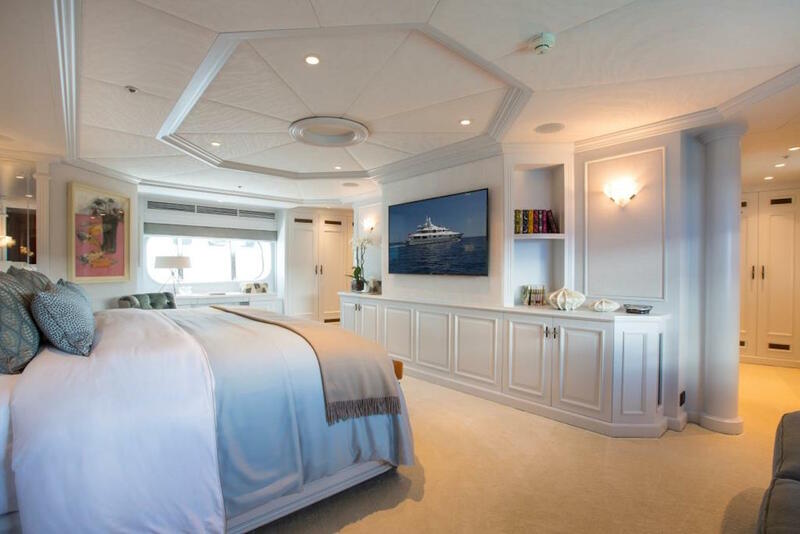 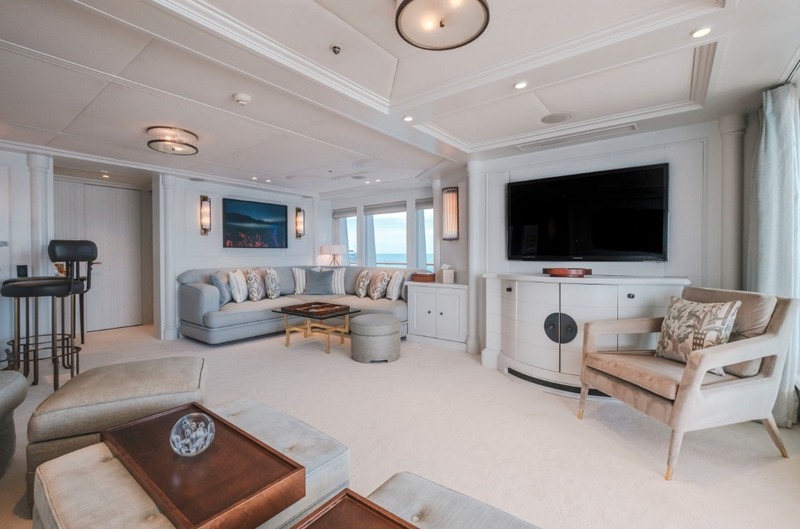 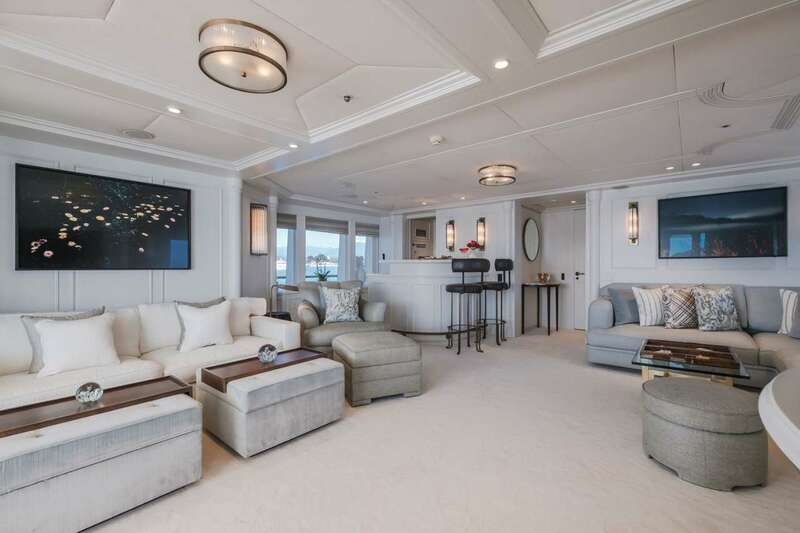 The super yacht’s layout and interior design display a thoughtfulness and quality which is matched perfectly to either entertaining or private relaxation. 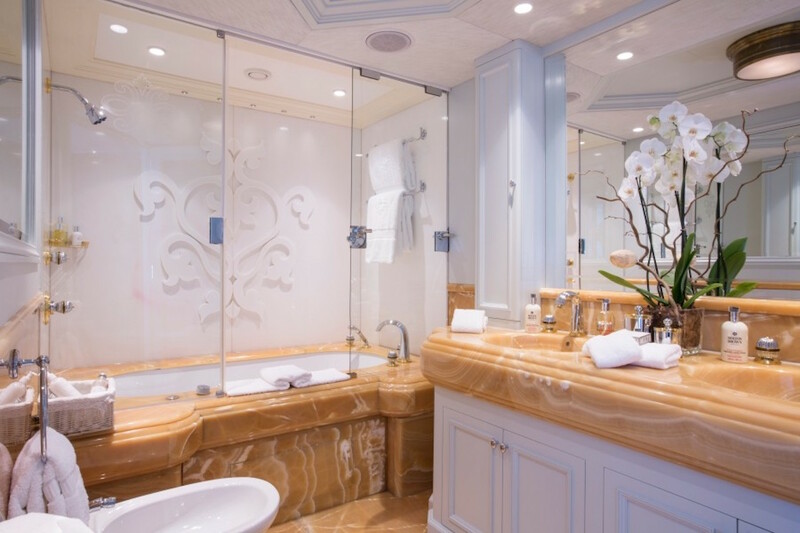 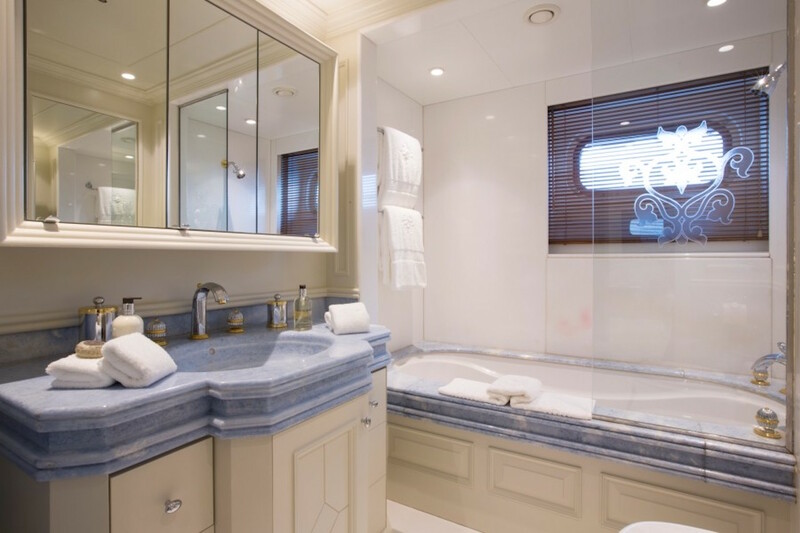 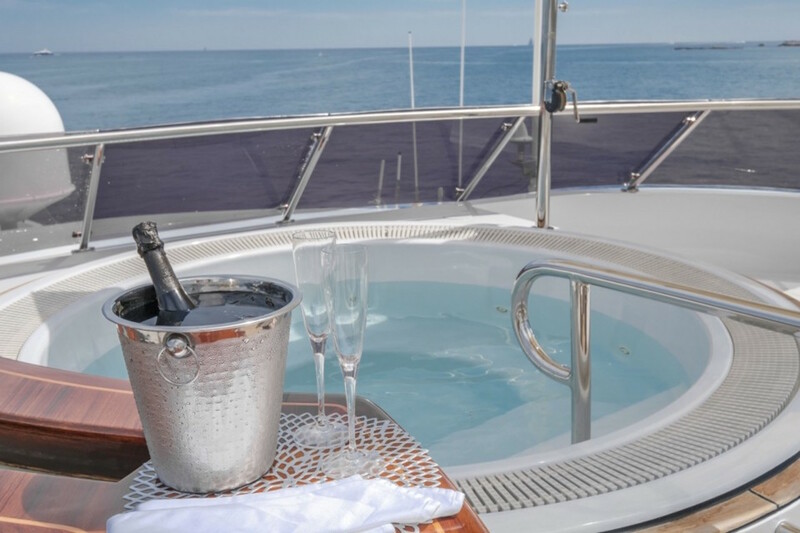 Luxury yacht Mosaique also offers well-appointed accommodation which features all the latest technology. 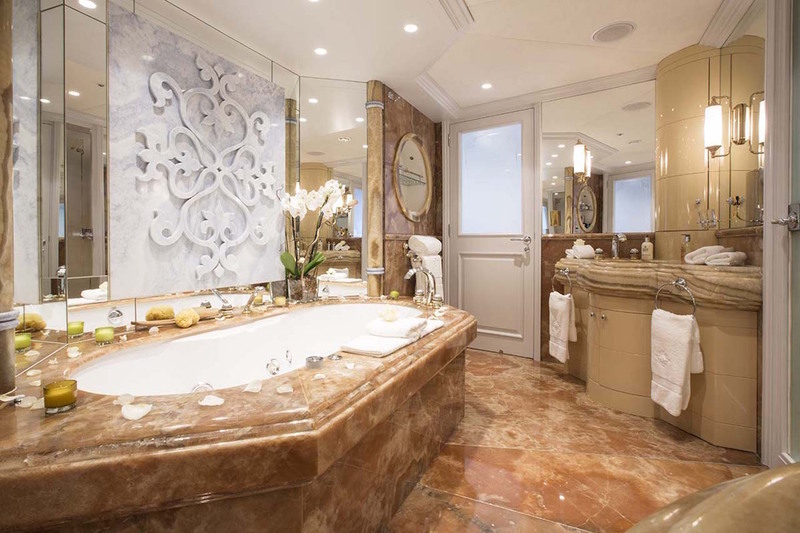 Cleverly computerised lighting throughout allows guests to create different moods as desired for each moment. 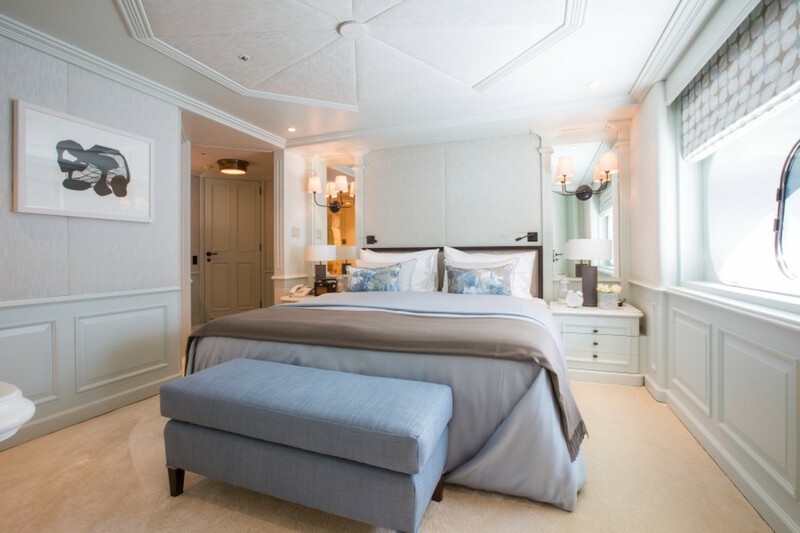 Her classically inspired interior is tastefully designed in a style which successfully blends modern and classical themes. 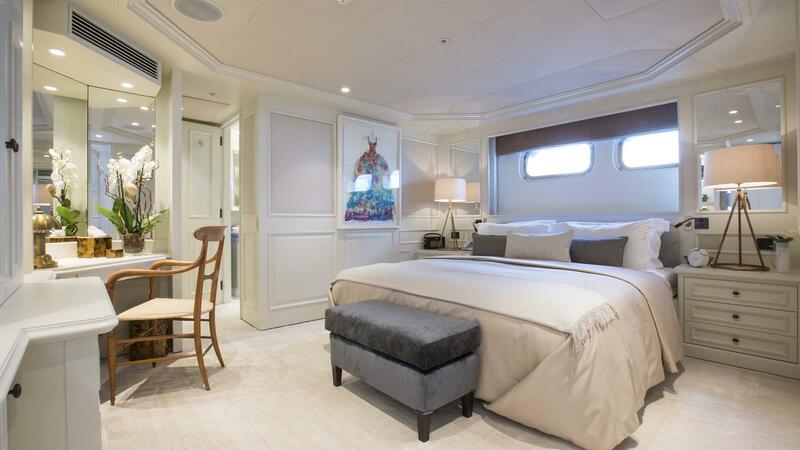 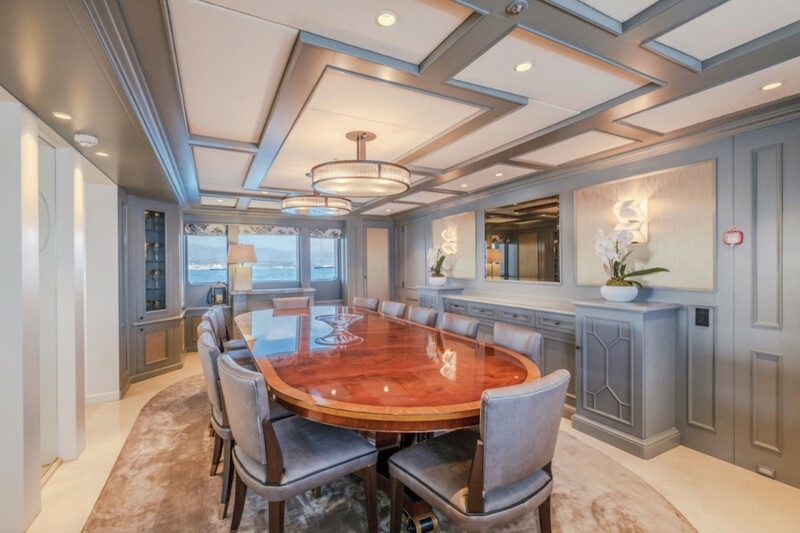 Glass sculptures are an interesting feature, and the yacht boasts wood panelling and comfortable seating arrangements throughout. 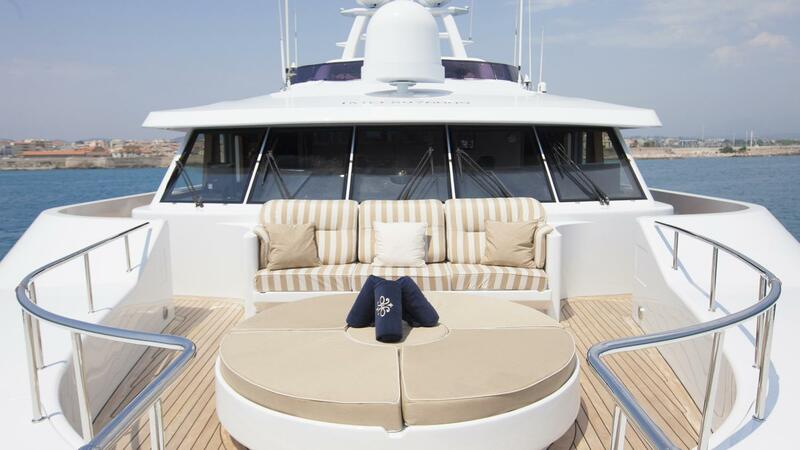 The onboard gadgets are also excellent and include a huge ‘pop up’ flat screen TV with surround sound in the saloon. 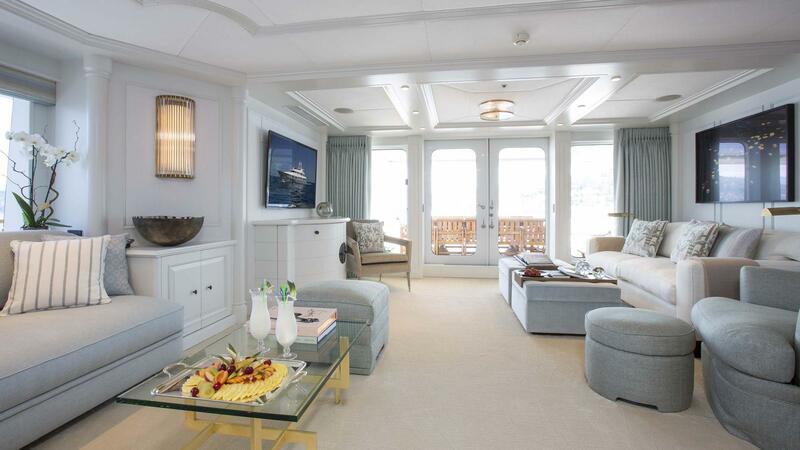 There are also smaller versions of entertainment electronics and hi-fi in the master cabin and master study. 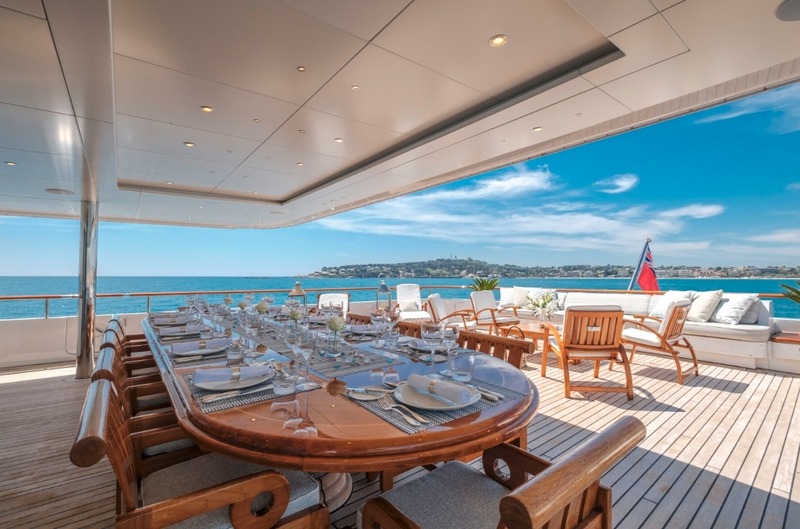 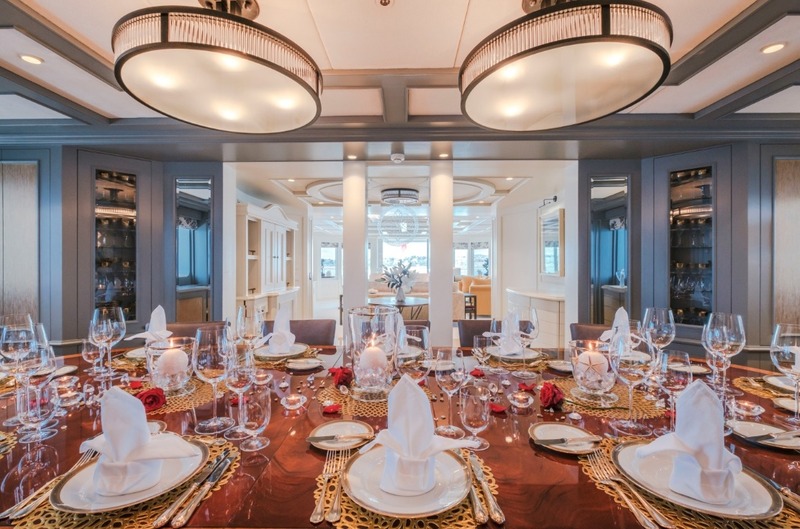 Luxury motor yacht Mosaique features a very large dining table on the upper deck which can easily seat 12 or 14 charter guests. 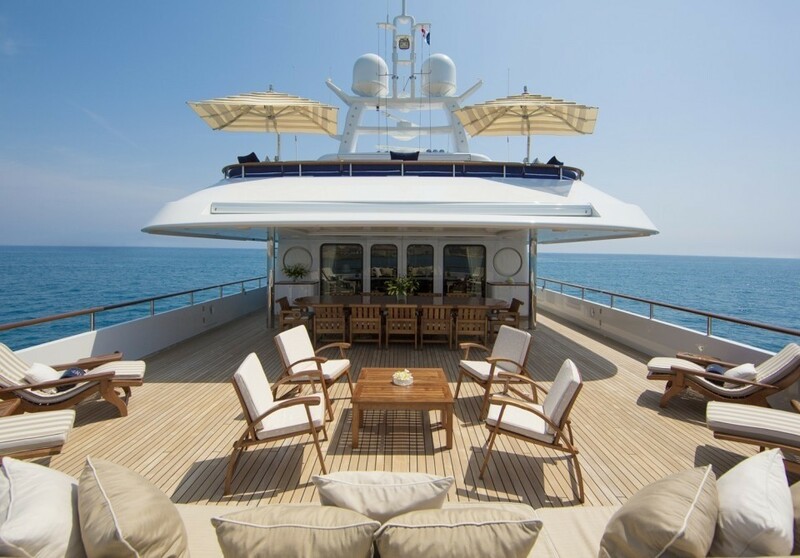 She also provides more than ample seating aft for outdoor entertaining. 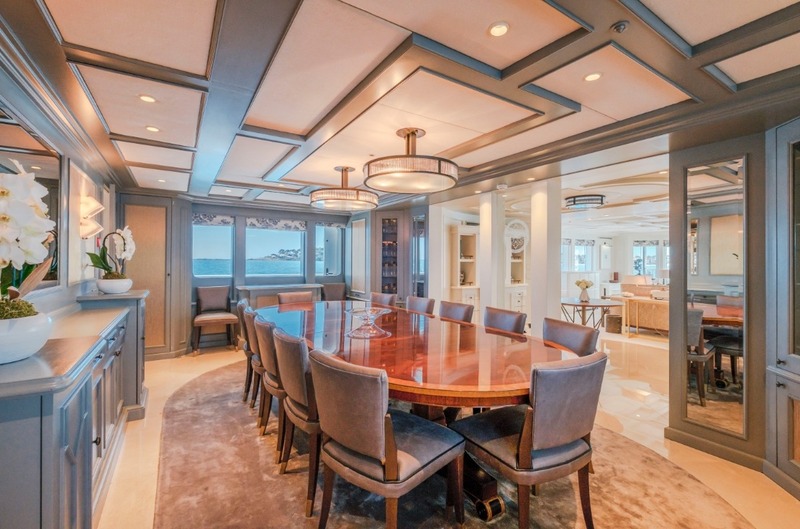 For more formal gatherings, there is a classical dining area forward of the main saloon. 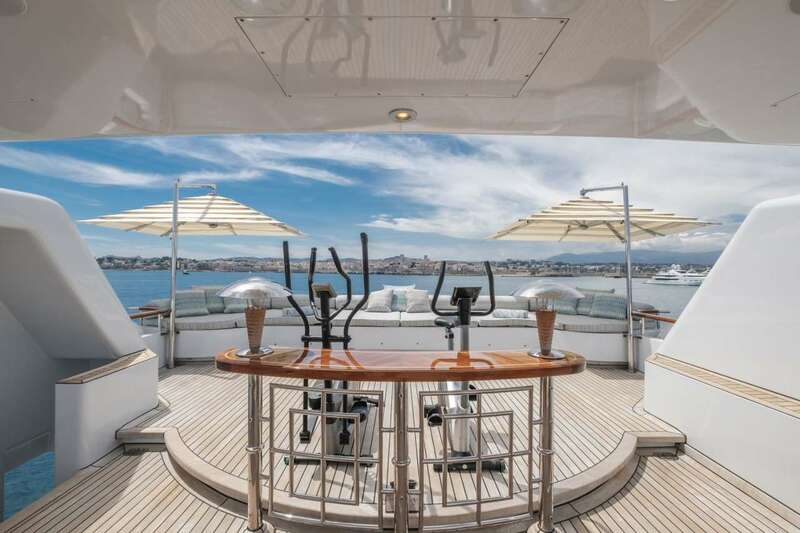 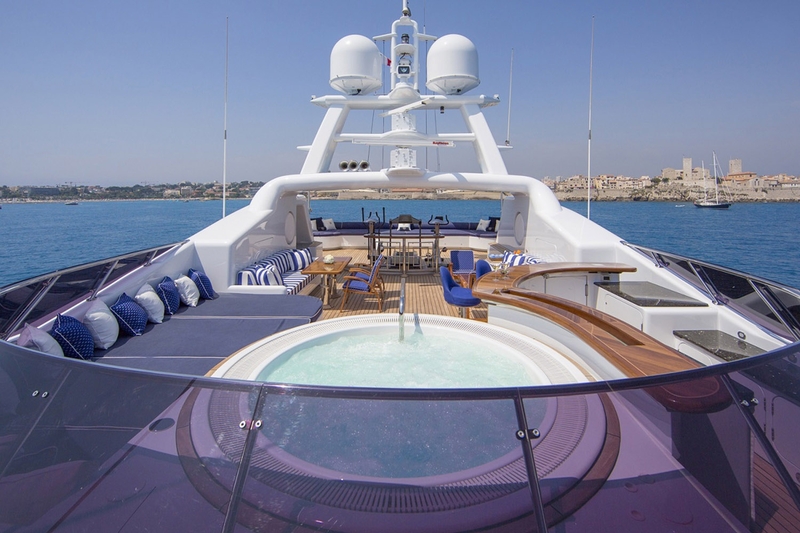 Her top deck is fantastic and includes a luxury cocktail bar, Spa Pool, plenty of space for sunbathing and ambient lighting for after dark. 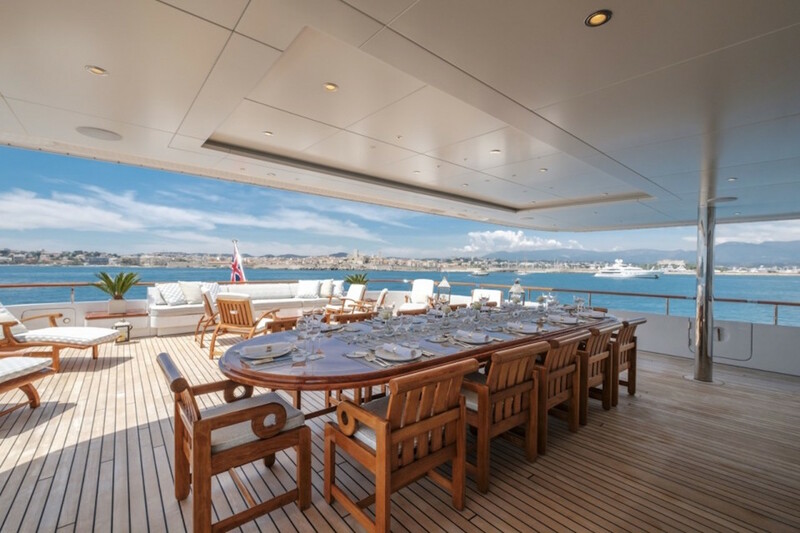 Mosaique’s covered outdoor dining table on the sky deck can seat up to sixteen guests in comfort and style. 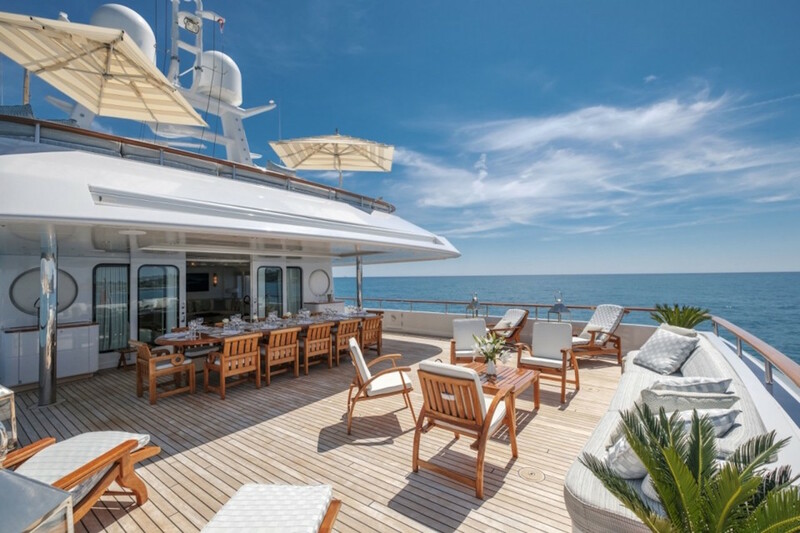 When a change of scene is required guests can retire to the smaller outdoor dining table which is adjacent to the main saloon. 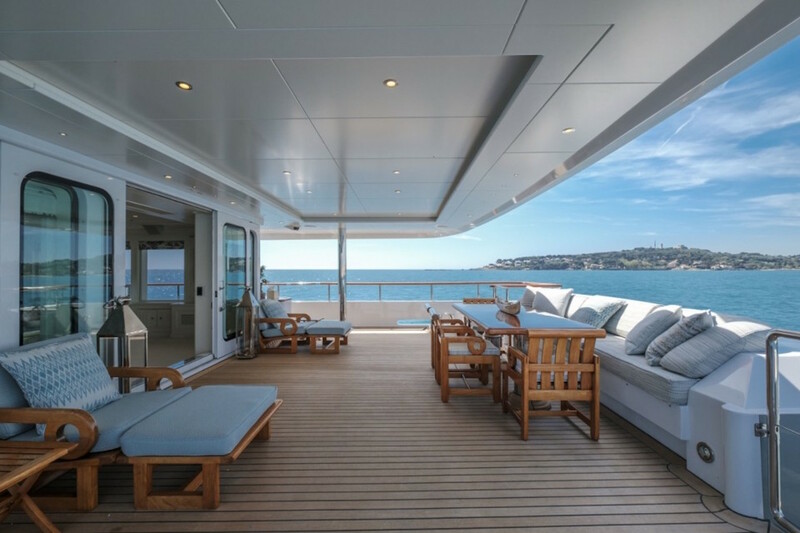 Her sundeck offers guests privacy and complete relaxation and includes a bar, informal dining area, Spa Pool and plenty of sun loungers. 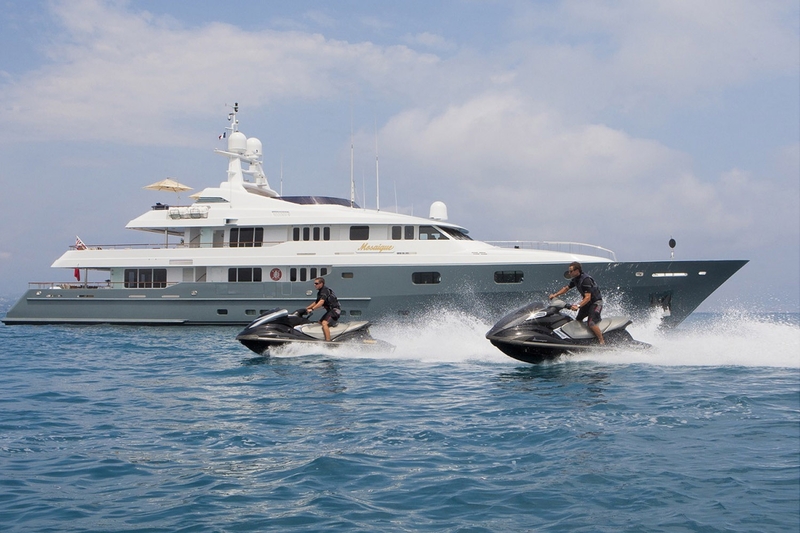 The yacht is well equipped with toys including jet skis, scuba gear and various inflatable craft. 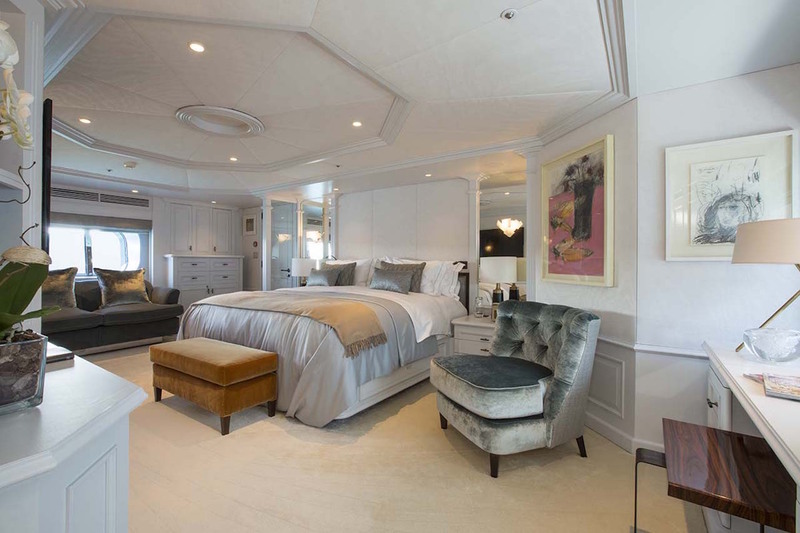 Spring 2005 - Interior refurbishment and improvements included new deck heads, wall panellings, bed spreads and headboards in the guest accommodation. 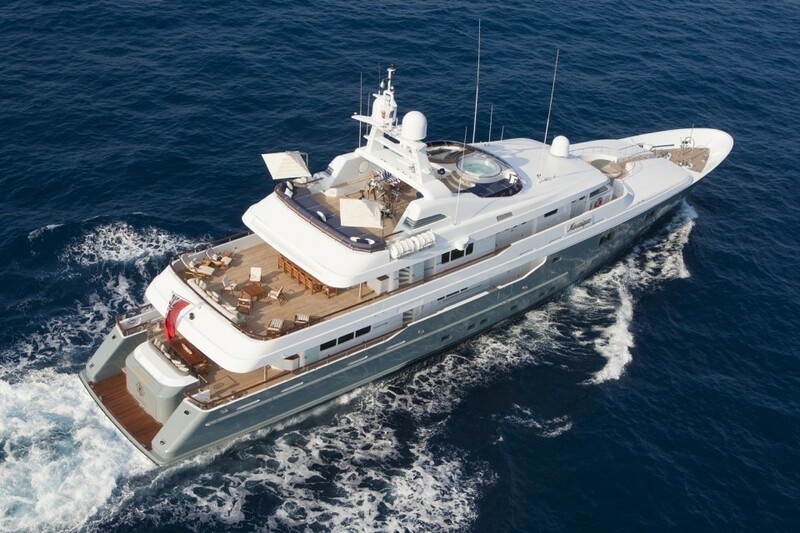 In 2005 the installation of V-Sat and zero speed stabilisers was also completed. 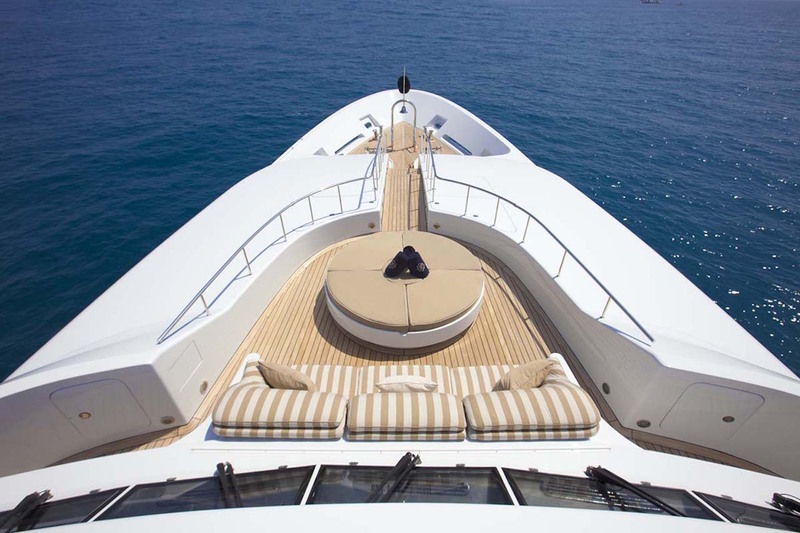 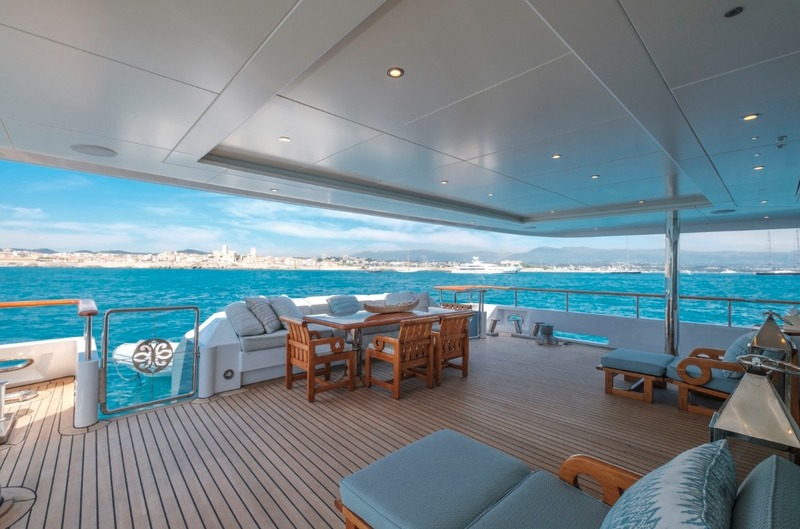 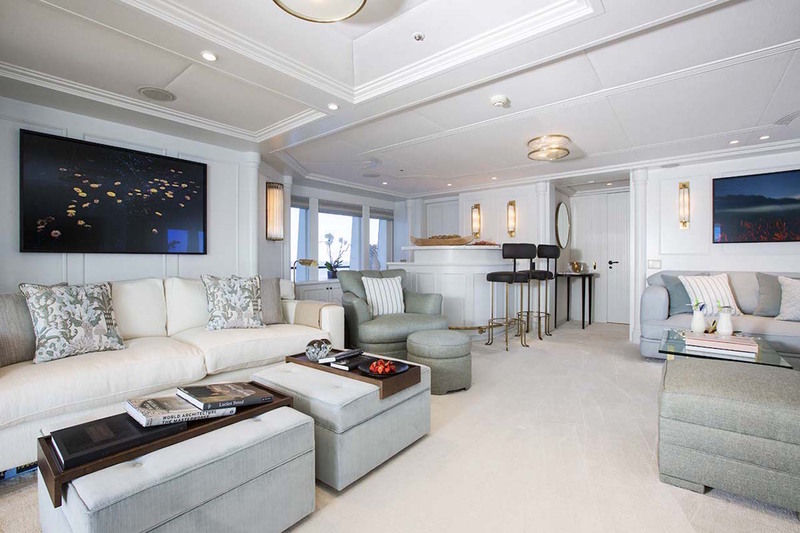 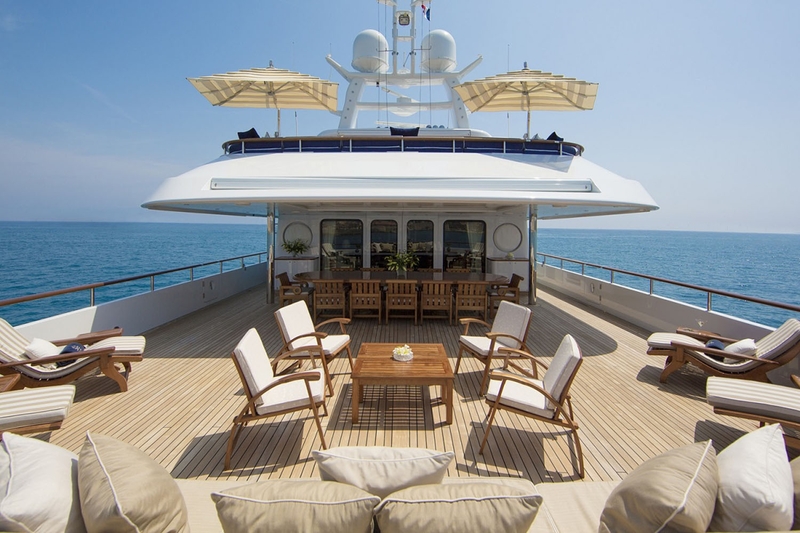 Autumn 2007 – All new audio visual system was installed throughout the yacht. 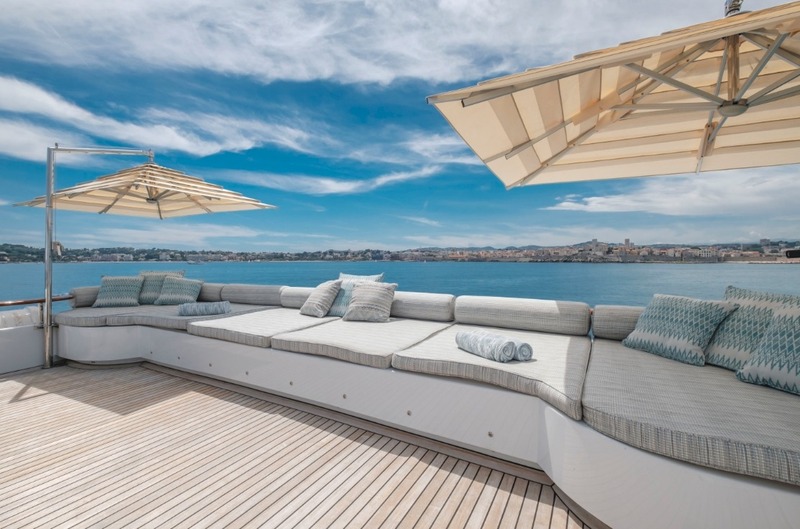 A new designer bimini to shade the sun deck bar, new soft furnishings with lots of beautiful new fabrics in the interior, new carpets in some areas, all new deck cushions. 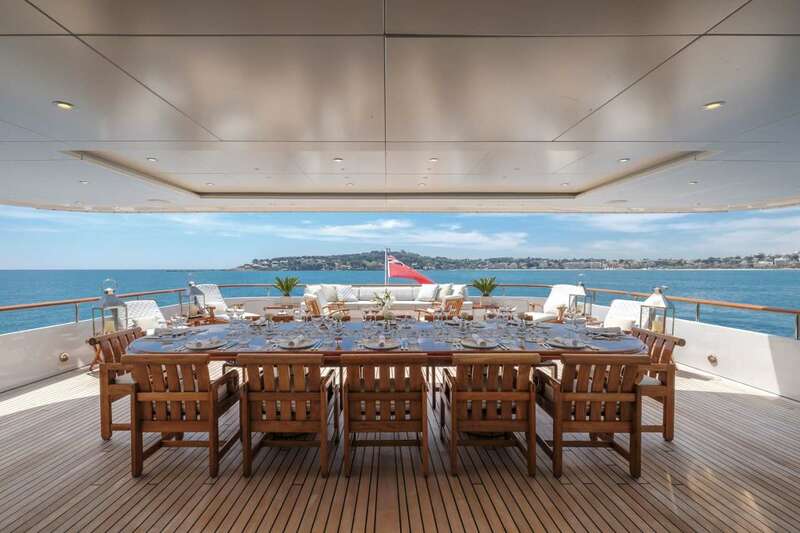 A new custom built extending/retracting large boat deck table so that the crew can cater for a big group or a more intimate setting with ease. 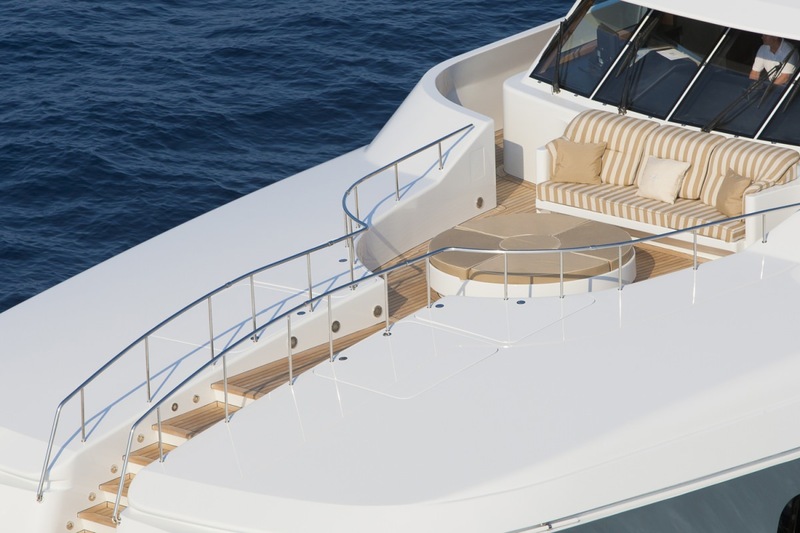 There are also new side screen/curtains for the boat deck and lower deck. 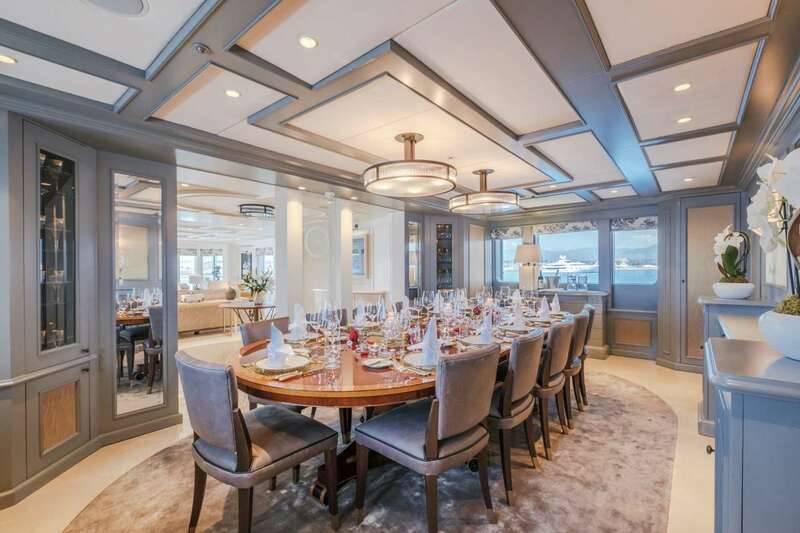 Maximum 60 guests permitted on board for specially arranged static cocktail parties and the like. 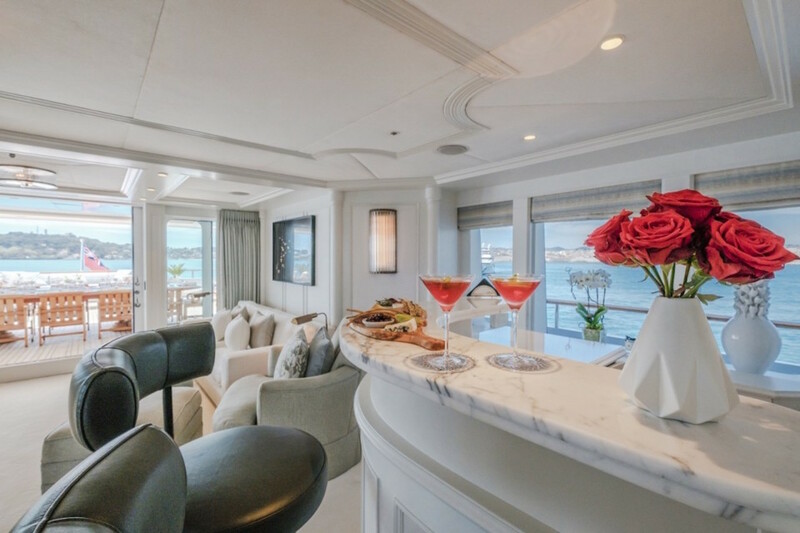 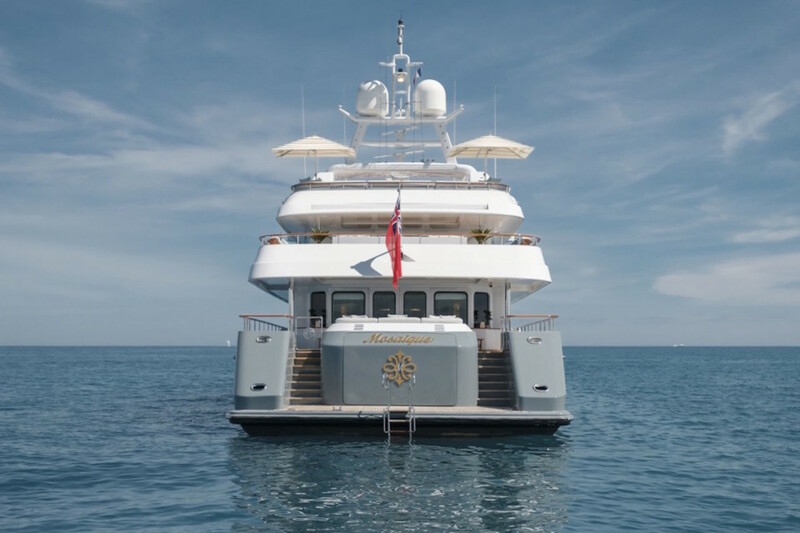 Luxury motor yacht Mosaique's onyx, marble and mahogany interior accommodates 12 charter guests in 6 staterooms, all with private ensuites. 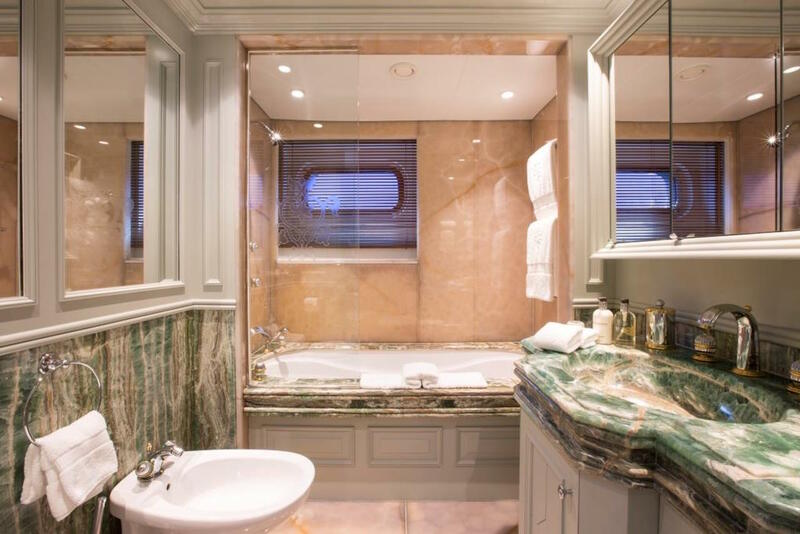 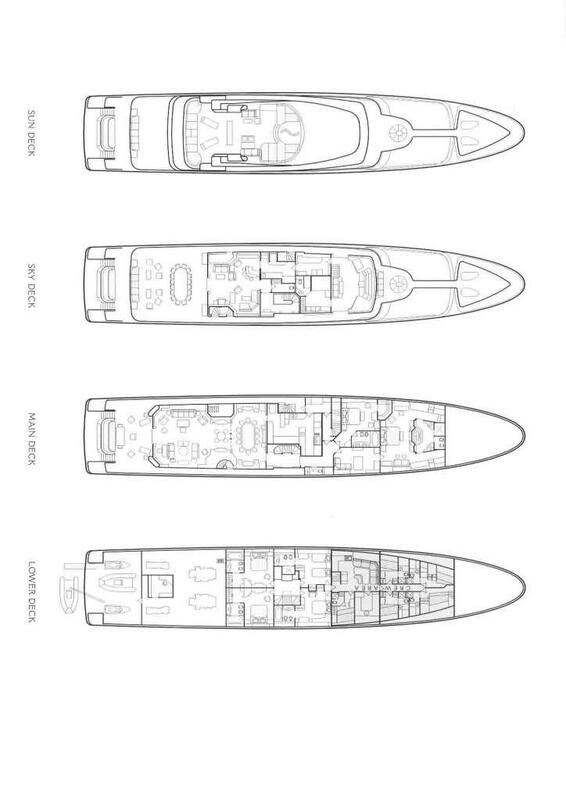 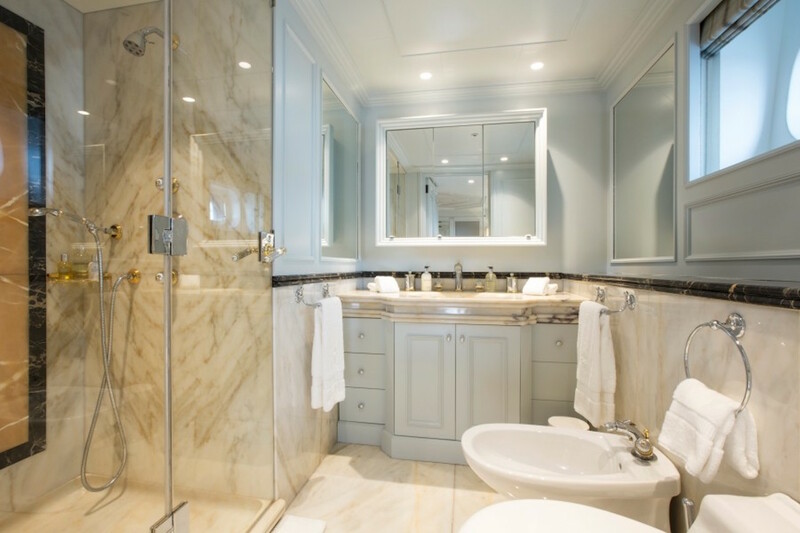 The master statesroom is located forward on her maindeck and stretches the full width of the boat. 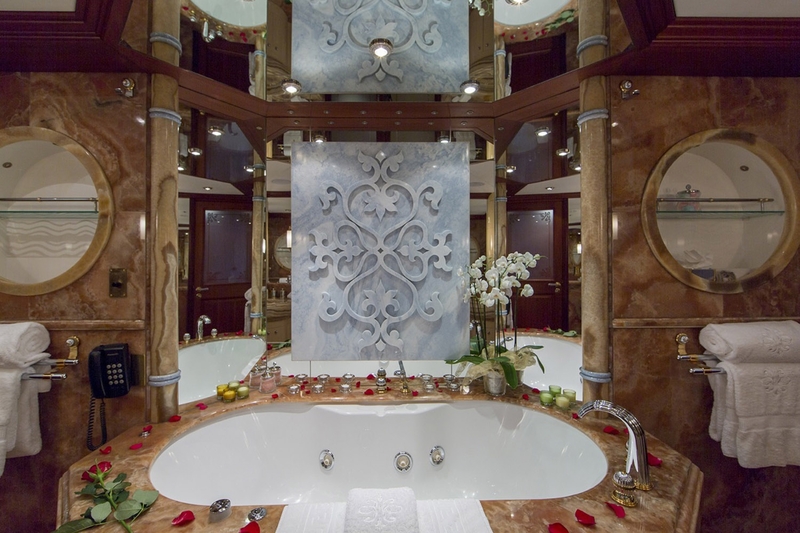 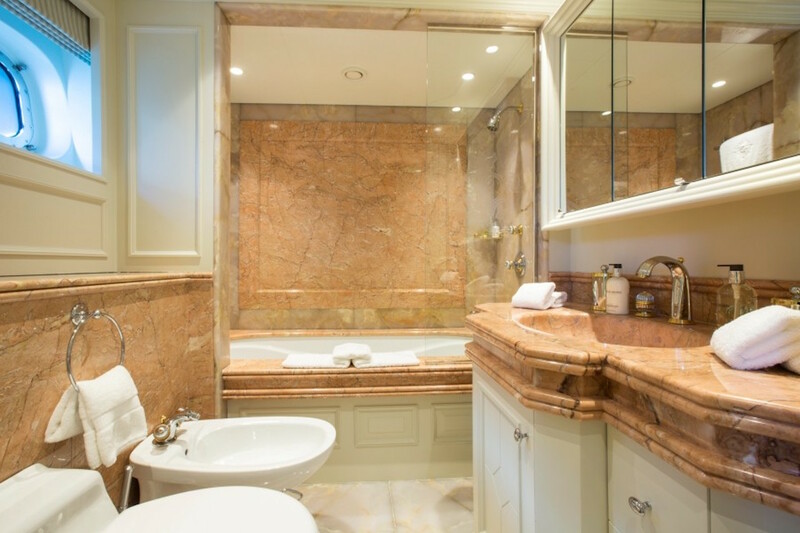 It is equipped with an ensuite, jaccuzi tub, showerroom and Hammam. 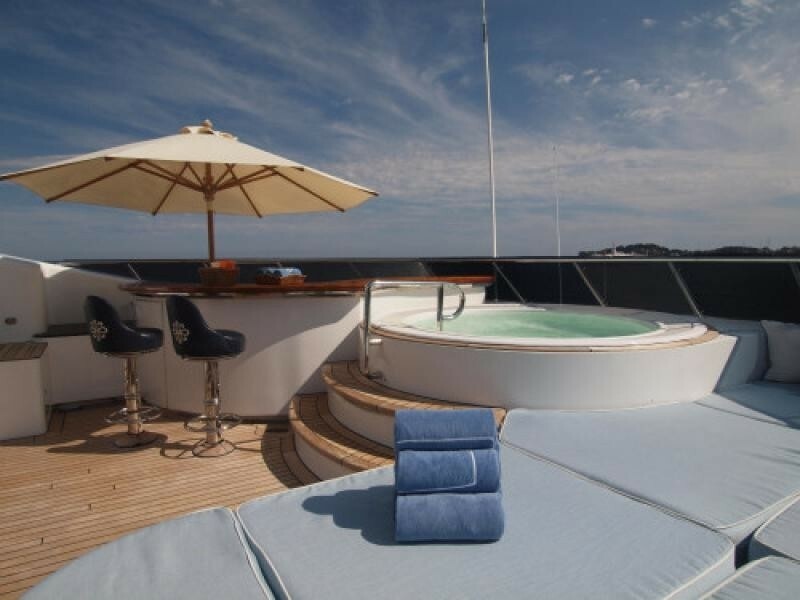 The VIP cabin lies adjacent on the main deck. 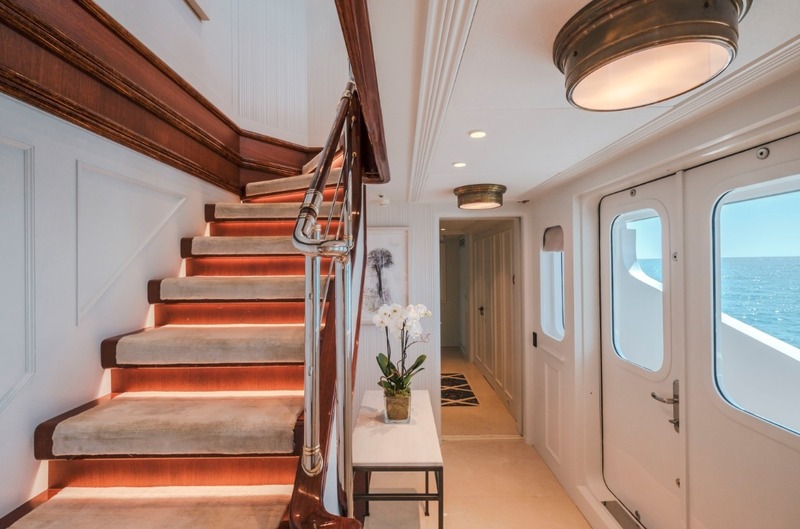 Stairs midship lead down to Mosaique's three more double guest cabins with ensuites. 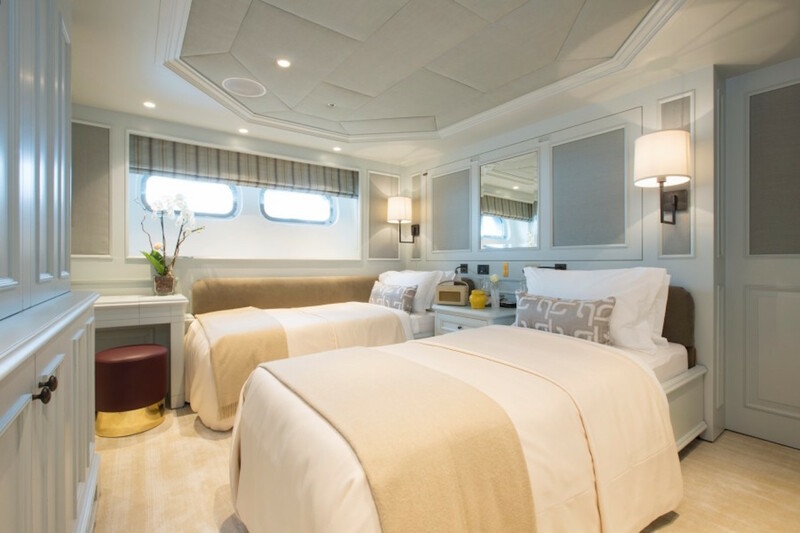 The sixth cabin is convertible between a double or a twin.